As I have been hinting in a couple of previous blog posts, I am on the road again (Goodness! That’s probably the phrase I have used the most this year! heh), although this time around a lot closer than in most business trips I have done lately. Yes, that is right. I am in Madrid again. And I will be here for the next couple of days (Till Friday morning). Main reason why? Well, a couple of months back I was offered to be part of a panel of a very special, inspirational and thought-provoking event and, of course, with such introduction I just couldn’t say "No". Thus here I am, back in Madrid going to take part on a very special event organised by IBM, called PRO-VOKE – El Valor de la Tecnología en la Empresa del Futuro (Inspirar, Liderad, Innovar). Something along the lines of "The Value of Technology in the Enterprise of the Future – Inspire, Lead, Innovate". 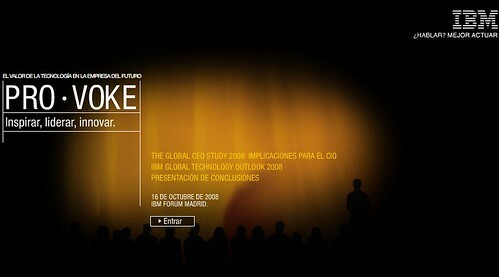 In short, IBM Spain’s Innovation Summit. This event is a one day show, in fact, a one morning show, but let me tell you what makes it special for me and why I just couldn’t turn it down. To start with it is that kind of events that, although it is not open to everyone, it’s going to have an impact, a very massive impact, at least, with plenty of folks, including myself, and I will explain why. Secondly, the agenda of the event looks very interesting and engaging as it will be a mixture of keynote speaker sessions, interviews, and a panel for the very end, which is the one where I will be participating. Amparo Moraleda (IBM President for Spain, Portugal, Greece, Israel and Turkey); Michael Wesch (Yes, the same Michael Wesch who has been educating us on the impact of Web 2.0 in our society going way beyond just the Internet itself! ); Lou Gerstner (Former Chairman of the Board and CEO of IBM from 1993 until 2002 & currently Chairman of the Carlyle Group); Jaime Arrazola (VP of IBM GTS Spain, Portugal, Greece, Israel & Turkey); and, finally, the list of panelists: Pol Mac Aonghusa (CTO Emerging Technology Incubation Center), Florence D. Hudson (IBM Energy & Environment Strategy & Execution Global Executive), Fernando Becker (Corporate Resources Director, Iberdrola), Felipe Bernabé García (Secretario General y Consejero de FCC (Fomento de Construcciones y Contratas)) and José María Fuster (Chief Information Officer of Grupo Santander). And, at the very end, to close off the event, Christina Garmendia, Minister of Science & Innovation. Well, to that, more than impressive, line-up of superb speakers & panelists you will need to add yours truly, as well, as I will be participating myself in the main panel and I can tell you that there is nothing so humbling as being part of such event, just by looking into the agenda! I feel just like going there and do nothing else than sit quiet, listen & learn! And that’s what I am planning to do, too! However, I was eventually invited into the panel session, later on in the morning, this coming Thursday, to talk a bit about the impact that social computing is having in the corporate world driving innovation into new levels of engagement, more specifically in the area of collaboration and knowledge sharing. Thus I will try to share some of my experiences and what I have been learning over the last five and a half years of Social Networking evangelism in the enterprise and how disruptive social innovation has been all along and where it may take forward the Enterprise of the Future. The event itself will take place at the IBM Forum in Madrid and although I know there is Wi-Fi available, I am not really sure whether I would be able to live blog / tweet it. One thing for sure is that there will be an upcoming blog post with the highlights of the event and key learnings I got from interacting with most of those folks. STOP talking innovation; START experiencing it! What’s the relationship of your work to the new IBM Center for Social Software announced last month? Sounds very interesting but kind of silent after the initial announcement September.